Royal Guest Rooms – If you have a princess or prince at home, and want to treat them to a special room while at Disney, consider a Royal Guest Room at Port Orleans Riverside. These rooms are over the top special, and feature ornately decorated beds that include a special fireworks display in the headboard, custom bed coverings and drapes to give the room that royal feel, unique art featuring Tiana and friends as well as other special touches including a flying carpet in each room! While there is a little extra cost for these rooms, they are totally worth it, and the only place like it on property. Sassagoula River Cruise – Yes, Sassgoula is as much fun to say as it is to cruise. The Sassagoula River stretches from Port Orleans Riverside down to Port Orleans French Quarter and then onto Disney Springs. Board a boat for a leisurely 2 1/2 mile cruise, there isn’t anything quite like it at Disney. Take the boat one way or round trip, totally up to you, as there is also bus service between Disney Springs and Riverside. Pool Hopping – My family loves to swim while on vacation, and we often return home from the parks for a few hours after lunch to relax and swim on a daily basis. If you are staying at Port Orleans Riverside, you have access to not only Ol’ Man Island at Riverside and the Swimmin’ Hole, but you also have access to Doubloon Lagoon at Port Orleans French Quarter as well, so your resort comes with two of the best pools on Disney property. Doubloon Lagoon is a short walk or boat ride down the river from Riverside. Nothing quite like giving the kids two great swimming options to choose from. 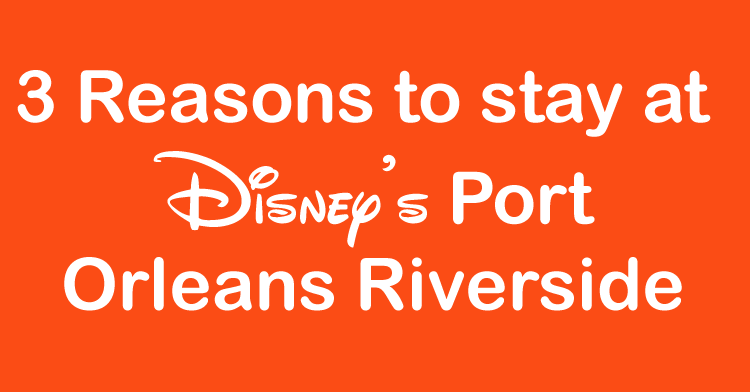 Of course, there are many more reasons to stay at Port Orleans Riverside. Why do you stay there? We have always loved the French Quarter and wish they had villas for the DVC. Many memories there before we were DVC members.